My grandfather, Nathan Maurer, told me that he would give me a million dollars if I typed the diary he wrote when he was a child growing up in New York City in the 1930s. I typed it, as you can see, and he gave me a million dollar hug. Before showing you the diary, I'll show you two pictures of my grandfather. The first picture was taken in April 1945 Buchenwald near Weimar, Germany (Grandpa, Leis, and Livingood). 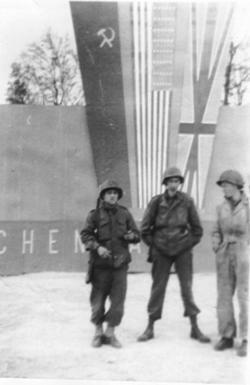 My grandfather was part of the US force that swept through Germany in 1945. 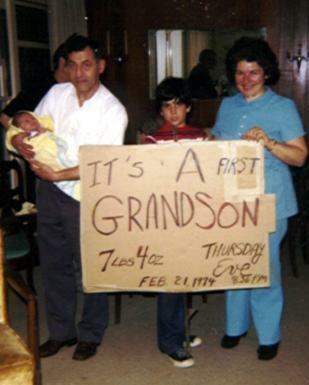 The second picture shows my grandfather, grandmother, and I on the day I was born. Also, here are my great grandfather's 1915 citizenship papers. Thursday May 17, 1934; 5PM 147st Burgen Ave. It is now that I begin to enter my life in a book of this size. It may seem funny to you that I, just a young boy of 16 years, 6 months, 7 days to write a book of his life. "How can he do such a thing when he is so young and hardly anything has happened during his life?" you might ask. But I answer I have done plenty of things which I want to write about and which is interesting to me. I want to express my doings, feelings, and thoughts as Hamlin Garland once did. He kept a diary about the age of 16 and so am I. Many biographies are written by men about another person's life, or a person writes an autobiography; but I am writing an autobiography of my early age and life. It doesn't cost me anything to do this. In fact, I enjoy doing it and I will enjoy reading it over and over. Writing about myself for my own good is what I like because in years to come I may improve. Some people like to talk about themselves. I mean "babble". But other people do not care about his life. But from what I am doing, you know now that I am doing it for my personal use. To begin with I, like everybody, was born. I was born on Nov. 10, 1917, at 218 East 98 Street in a section called Yorkville (near Harlem) which is in Manhattan, which is in New York City, which is in N.Y. State, which is in ------- oh, well, you can figure out the rest (mapquest). The neighborhood was largely populated with Jewish people. Of course, I was born of Jewish parents. The World War was on. I was born during the midst of the war. My uncle, Max, was drafted into the war. At that time women were working on men's jobs. Some were driving horses and some were conductors on the street lines. It was the death of thousands of men, while it was the birth of me -- my beginning. I will tell more of my family and other relatives later. My parents tell me that when I was about one year old I used to sit by the window and try to get the moon which I thought was a ball. They all laughed at this, but what did I know then? When I was about seven months old, I was taken to the wedding of Gussie (Pa's sister) to Aaron Borkan. Gussie is also a cousin to Aaron. I can not remember that wedding. About two years later I went to Esther's wedding to Jack Turer. Neither can I remember this wedding. In about 1922 I went to Max's wedding to Annie Haber! I also remember that wedding a little bit. I remember that I wore a white suit, that we took pictures of the family, and that when we went home I was very tired. I lied down on a bed and fell fast asleep. Max, my uncle, was drafted into the war in 1918. But before he had a chance to be sent over, the war stopped and armistice was declared Nov. 11, 1918. I was one year and one day old then. Everybody says that when they heard the news, they all ran out into the streets and danced for joy. My first memory is the wedding of Max. Another memory is the time when my mother left my brother, Abie, and I alone in the house. She went to get her teeth fixed. At first we played with rice, pretending that we had a stove. We also turned a chair over so as to make it a horse and we turned the wheels of the sewing machine to pretend that we were riding very fast. After a while we got to feel as if we were alone and we got scared of that. So we hid ourselves in a clothing closet. Any little noise frightened us. After ten minutes we heard someone at the door who we thought came to kidnap us. Then the person walked into the house and by the footsteps, we could tell that it was our mother. Block parties used to be common on 98 Street (mapquest). But I could hardly remember them. No one who lived outside the street was allowed into the block. Every year in November when it was election day there used to be fires in the streets. Every block had a gang who went to fight another gang to put out there fires. It was very dangerous to go out at night because the gangs collected bottles and threw them at their opponents. They also threw them from the roofs. A boy went out into the street with a helmet. Someone threw a bottle from the roof on the boy's head and the helmet split. Police cars rode the streets to keep peace and order. This happened every year. When I was born, Mrs. Glashow, a neighbor, sad that when I grow up I would be very wild. She called me Nijenya "Bum". My Jewish name is Nejemya. My brother, Abie, was born on March 9, 1920. He was named after ma's father who was killed in a synagogue in Austria. The murderers tried to brake down the synagogue. I forgot to write that we moved to 215 east 98 Street (across the street) before Abie was born. Very early in the morning of December 10, 1924 the family was awakened by noise in our house. Abie was frightened and began to scream. There was a doctor and a nurse in the house and Abie must have thought they came to see him. I now have different thoughts in mind to write about. During the summer months we used to sleep on the fire escape. One night I awoke and saw fire engines speeding down the block. The noise woke me up. Everybody in our family was awakened by the noise too. There was a fire in the Domestic Laundry near 2nd Ave. It is so long since I lived in 98 St. that I cannot remember many things nor can I tell which happened before the other. The best thing to do is to write the events anyway. At the stoop of the building there was a store rented by Mr. Coveno. It was a stove where washers were made. My first job was at that stove where I picked the washers out of a short of rubber. Hyman and Abie also worked on it. We would usually get 30 cents each. But this job was only for a while. Very often Pa and the family would go to Central Park by the reservoir. We sometimes went morning, noon and night. Very often I would go to the playground on 101 street. One time in the summer Abie went with me. There we got on the merry-go-round and some big 16 year old boys turned it so fast. Later Abie and I went home feeling as if we would throw up. I fell asleep on the fire escape. When I had to get my tonsils cut out, ma told me that I was going to the country. But I was fooled. Hymie and I used to go to Hebrew of the YMHA 92 street and Lexington avenue, on the old site. On January 1925 I was playing with a fire and my foot was burned. Pa carried me all the way to the hospital in the snow. I had to put on a salve in order that it should heal. I have a mark on my right foot just above my ankle. Pincus bought a tube set from Spinared. While my foot was healing I listened to the radio. Just 8 years and a day ago we moved from Manhattan to the Bronx. That day was Sophie's birthday. We packed our things and the truck rode away with Pa, Hymy and Abie. Friday, 12 noon, august 24, 1934. I am going to write my diary all over again, with some changes. At night we had a party at our house and we made a small club. Did some homework in the morning and then did odd things like fixing this book (original) to make a diary. 1PM Went to YMHA played in the gym. 2PM Went swimming. We were given swimming instructions. 4PM The Carlyle Club met but there wasn't enough members to make a meeting as we just spoke things over. I volunteered to be secretary for that day. At night Hy and I read the comics in Joe's house. Milty called on me this morning and we went to school . After school I went home, ate, and then started my homework. At 6PM I ate supper, then finished my homework. Then at 10:30 I went to sleep. This morning I had a little time so I began to write this diary. Practically the same thing happened last yesterday. Nothing unusual today except that I went with Joseph Umansky, a school friend, to get a harmonica on 138 street. I did my homework while Abie dictated. Then we went skating. We took Sophie's skates and our own. We decided to go to Morris High School and I suggested that we visit my annex, too. On the way I lost a screw from my skates. I rode on one skate. After we got to the school, we rode to Thaler's house on Boston Road. He was a school friend who left school and got a job. He was not home when we went to his father's stationary store on 3rd avenue. He soon came home from work. We were glad to see each other because we had been separate for about 3 months. I fixed my skates in his store. Later Abie and I left him and went to my annex on 3rd Ave and 157 Street. When we got home I gave Frieda ride and the Turers rides on my skates. At 9PM we went to the bridge on 125th street. On the way back we found a test tube, a jig saw puzzle and a horn. We had a lot of fun with the horn. I went to sleep at 11:30. Today I stayed home because it was raining. I played my harmonica and the jigsaw puzzle and horn which I found yesterday. I also ate plenty of cake and did some homework, then fixed my skates. Finally I wrote post cards at the post office to club members. It was a cold day. Hy, Abie and I went skating at night. We rode to the bridge and went whizzing down to 125 street. Boy! What speed!! What fun!!! We enjoyed it even more because it was cold and skating kept us warm. In the morning I went skating around 136th street. I stayed home in the afternoon and read part of "Beggars of Life" by Jim Tuly. Then I fixed my drawer. At night I went to the scouts and passed my 2nd class test. I had to read maps and construct knots. At 10AM Abie and I went to the park to practice football with the scouts. Later Pa gave me a very good haircut. At 8:30 that night we had a party at Sylvia's house. Sylvia was a classmate of mine who ended up marrying my brother Hy. Sadly she died at age 22 during an operation for intestinal failure. Hy had tuberculosis and was only able to live with the help of therapy. The party was partly was devoted to a meeting of our club. We had elections for officers. Sylvia was elected President and I was elected secretary. It was a cold day. At 9 in the morning I went to the theatre free of charge. The Hebrews were sponsoring the picture. We saw a cartoon, "When a fellow needs a friend" with Jackie Cooper, and a picture of ice skating and skiing in Los Angelos, "Snow Birds". They were fine pictures. Later at 12:30 I went to the YMHA, a Hebrew school. Our club played basketball against another club. This was the first real basketball game I ever played. We lost almost without scoring. At 4PM our club met again. I was made temporary secretary and later elected permanent secretary. Schwarz ran against me for the office of secretary. This was a usual school day. I went to get shoes after school, but didn't get there in time. I also sent postcards to the club members informing them of upcoming meetings. In school, I got a physical exam. All I needed were some fillings in my teeth. Today is the day before Columbus Day. It is 4:30PM and I have a lot of free time, so I am going to write in detail what usually happens on a school day. At 6:45am Hy and I wake up. He tells me to go to sleep because we have until 7 o'clock. At 7am I hear someone call me and I already know it is Hy. Then he calls Frieda and Abie. I turn over in the bed, still feeling as if I can sleep forever. My eyes are half opened and my feet and hands refuse to move. I force myself up and take a bathrobe. Then I get out of bed and dress. I fill my fountain pen and sharpen my pencil's and pack my books. Then I wash myself in the kitchen and eat. The radio is turned on. While we eat we hear the Organ Revelies. At 8AM Milty calls on me and we start for school. Today we studied part of Lincoln's Second Inagural Address. While going to my room in school, I usually met Joseph Umansky, a heavy set young Jewish boy. His family often took me places in their car. Today we spoke about speech, homework and harmonicas. Then I went to room 204 to study some Spanish. At 9am I would speed into room 211 to catch Miss Hildenbrand's class. Today we first rewrote Lincoln's speech and then we recited it. When I was called up, I was nervous from the start. For a while I couldn't remember anything. But finally I finished it. The teacher said I shouldn't twist the speech. At 9:45am I would go to room 208 to attend Mr. Stark's book keeping class. Today I met Milty in the book keeping room and I warned him about English. He wanted my jacket so I took his lumber jacket. In book keeping class today Scott sat next to me and we learned some new material. Weiser told me later that he argued with the teacher because he made up his own words for the speech and made it all wrong. My Spanish class began at 10:20. The instructor was Mrs. Kups. Today we corrected yesterday's test. I scored 79%. As usual, we had a test then went over the homework. We had club period. My club is called the "Young Orator's Club." Today we held elections. Scott and Kolchinsky were in the club. We gave some speeches. They both spoke and we had a lot of fun. Our lunch period works as follows. Half of the school goes to lunch while the other half are in their classes. After eating I would usually go out in the yard and play ball. At 12:30 I would have history class with Mr. Bunis in room 203. Today we got our homework assignments and had a test. I did OK. Then we went over past homework. Then at 11:15 I had Mr. Becker's class in room 103. Scott asked me to go to work for him on Saturday because he has to go away with his mother. He offered me money, but I refused. We had exercise in the yard, then played basketball, "5,3,1." Next my stenography class met at 2:10PM in room 206. Mrs. Halpern was the instructed. Fortunately she gave us no homework over the forthcoming holidays. We had dictation all period and I got every letter she dictated. I worked at 60 to 75 words per minute. The school day ends at 2:35PM. Today I met Scott, Robinson and Umansky and we walked home through Bergen Avenue. Scott and I went to see his boss for Saturday morning. Then Umansky and I went to get a harmonica in the Brook's music store. I left him on 141st and St. Ann's Avenue, then went home. I ate dinner, then wrote this diary. Sophie just came home with news that there are very good rooms on Charlotte Street. I decided to not write my homework but to listen to her tell about all the rooms instead. I'll have to wait until tomorrow to find out if we take the rooms or not. I am anxious to move because we have lived in this neighborhood for about 7 years. At night Sophie, Abie, Frieda, Eddie Borkant and I went skating on Alexander Avenue. Today is Columbus Day. There is also a Jewish holiday on the same day. We rented the rooms on Charlotte Street. The address is 1505, Apt 2C. Pa went to see the rooms and said they were nice, but Sophie and Ma rented the rooms next door. Then when they got home Pa complained because he said that the other rooms had more sunlight. So Sophie and Pa went back and changed the rooms. In less then a week we will be moved into the new apartments. At night Seymour and my cousin Jackie Borkan were trying to run away from me in the park. Seymour ran around the candy store and I followed. Then he saw someone run past him without noticing him. He thought I was trying to play around with him so he chased the boy. The boy jumped over a rail and Seymour followed. Then over another rail. Seymor caught up with the boy and grabbed him. Someone else was chasing the boy also. But when Seymour stopped him he wanted to sock Seymour. All the time Jackie and I were laughing hard. I stayed home and did some history. At 5PM Scott came over and told me I didn't have to work for him tomorrow. He spoke a while, then left. At 7PM I went to the scouts meeting. We held the meeting in back of PSG because registration for election was on. Goldman lectured to us and said we were falling down in our standards. I went to the park this morning to play football with the scouts. I also did some skating. At 3PM I did some homework and skated to the market with Hy. Later that evening I went to Joe's house to hold a club meeting. I went to 136th Street and played the card game 7 1/2. I came out winning 5 cents which is good because I started with only 1 cent. Then I went to the Y and exercised in the gym, swam and wrote club minutes in the library at 4PM. At 7:30 we had a club meeting then later I did my homework. I found out that Regina was engaged to Jack. Today was a typical school day. Weiser moved to Brooker Avenue and 140th Street. We are approaching the day when we will move to Charlotte Street. I think it will be Friday. I called Scott and Robinson before going to school this morning. I urged Sctott to play basketball in PT period. He played well for the first time. After school, Scott and Robinson went home with me. In Stenography today the teacher dictated a story (written by Franklin) to us at 60 words a minute. I got every word. Today is the day before we move. We are preparing for it. Tonight I finished my homework quickly in order that I may help pack up. It is exciting now and I'm in a hurry to help pack. I'll be back later. Pa says I'll have to stay home from school tomorrow, but I hope I don't have to. I woke up at 6am and Pa told me I'd absolutely have to stay home and help move. At 7am the moving men came. They began taking our things into the truck. Abie could not go to school because his books were in the dresser in the truck. He stayed and helped pack. When all was done the moving men left. Pa and I had to take the car to the new rooms. After we got off the car we found the truck on Seabury Place. They refused to carry the things up the house because the street was broken and they could not get the truck near the house. I began to feel that we would have to stay in the old rooms. Pa called up Drucker and said he could pay $2 more. The men dragged the stones away and got the truck in the block. At 11:30 our things were all in the new apartment. Sophie gave the movers $9 and $3 tips. We started to unpack and fix up the apartment. At 1PM I finally ate breakfast. The only thing I had eaten before was 3 slices of bread, a pear and I had drank some water. Later at 7:30 Abie, Hy and I got on skates to go to 136th street. Max passed by the stoop and found out we live here. On the way Hy's skates fell off 4 times and so he had to go home because he hurt himself too much. I left Abie on Westchester avenue and 158th street. Abie went to the scouts and I went to pass my 2nd class test. I was lost for some time, but eventually I found the school and got the test. I hardly knew my knots but I new compass, signally and first aid. I passed the test and received a pin (2nd class). When I left the school, the man who tested me on the first aid taught me about handicraft. Later I skated to Scott's house and stayed a while. Then I went to the scout meeting at PSG. When the meeting was over, Abie and I went to our old rooms and looked them over. It was very dark and a little cold. Abie had some matches, so we made a fire on an iron box. I made a torch out of paper and walked through the rooms looking everything over. When the paper burned up, I made another torch and walked through the rooms again and again. Sometimes flames fell on the floor so we put them out with a bottle of water. We started home with 2 broomsticks and a horn. I sang through the horn to keep up our spirits. We got home at 11:30PM. At midnight we went to sleep in Abie's bed. Sophie was sick, so she and Ma slept in Regina's house. Today we fixed the house up a little bit. At noon I skated with Abie to the old rooms. Pa, Hy, Abie and I cleaned up the rooms. I went down to the cellar and collected the dirt. Later Hy pulled me up through the dumbwaiter. Hy and I went home with some things. Sophie was sick in the Lincoln Hospital. She has been there since this morning. I am worried about her condition. She has some sort of intestinal problem. At 5:30 Abie and I went to see Berny. We left him to eat supper and then went to see him again. We had a lot fun with his gang. I went to sleep at 11PM. Molly walked here in less than an hour. We went to the Y, Gym and swam. At 4PM we had another club meeting. Mr. Erdos became our new leader. The family visited Sophie in the hospital. She was very happy to see them. Phil brought Bella over to our house. I'm learning this neighborhood and writing this diary in Phil's bedroom. Here is a drawing of our apartment. I did some homework then went to sleep at 11PM. Today I went to school on the Boston Road car. After school Abie and I went to see Herman Ridder JHS play my annex in Basketball. We won 19 to 5. Later we saw Bernie at his house. I did homework at night and went to sleep at 10:30. The weather is very wet today. At school I got almost all of an 80 words per minute dictation. Today is very cold, the coldest this autumn. After school I called on Abie by Clark JHS and went to visit Sophie at Lincoln Hospital. We were glad to see each other. Today is even colder. In History class we had a debate. The question was, "Which is more important, the candidate or the party?" I believe the party is more important because Norma Thomas would get in if he had a good party backing him. Sophie is still in the hospital. I went with Edith to visit her there today. I will visit her again tomorrow. During club period in school, the Young Orators had a excellently arranged program. Scott spoke on France and Germany. During lunch period a group of boys sang about McKee and Robert Minor. Mrs. Kurto became angry because of the noise and told us to stop or go away. Then suddenly a penny came flying out of the window. Everyone jumped for it. The boys made up stories that she was a communist and that is why the penny was thrown to them. I saw Sophie at the hospital at 7:30 that evening. Abie and I skated to the scouts where we had an apple game. Abie and I met the scouts at the Coca-Cola plant on 165th street and Washington Avenue. Mr. Campbell gave us a talk on how Coca-Cola is made. Then he took us on a tour through the plant. Since the NRA the workers do not work on Saturday. So we couldn't see the machines in action. Later we went back to the room and got a ruler, a set of nature cards, and SODA. All we wanted, with crackers too! I drank 3 bottles of soda. When the party was over we gave Mr. Campbel 3 cheers. That night at 7:30 Abie and I went to the library on 169th Street. I took out a book on speeches for school. Phil got a license to be Bella. At 12:30 I went to the Y and at 4PM there was a club meeting. After the usual business, we learned dancing again. At 3:30PM I saw Solomon. He is running for mayor on the socialist ticket. La Guardia and Ms. Kell were there before, but I was swimming at that time. O'Brian was unable to come. This evening Mrs. Glashow and Gertry came. I could not recognize Gerty. Everyone was surprised to see them. The last time we saw them was 5 years ago in 137th Street. We spoke about the old days and how they have changed. At 10:30 Ma and Pa came home from their visit with Sophie and we were surprised to see them. I went to sleep very late. I walked to and from school. Other than that it was a usual school day. During lunch period I played a good game of football. In PT I played in doors baseball well. Went for Mr. Bunis, my history teacher, to Mr. Gitlin (a former Morris teacher) for a football and pump. I had tests in all of my subjects except history. When school was over, Scott and I went to room 311 to join the Arista. Here are the questions I was asked: Are you an MO member? Why do you want to join the club? What did you do in your Honor society in junior high school? What clubs do you belong to outside of school? Are you and officer in any club? What club do you belong to in school? Do you like to read or play sports? What service have you done in school? I have to wait two more weeks to find out if I will be accepted. Later I went to the main building. I saw my annex beat Monroe annex 48. The score was 22 to 5. Tonight the gang saw "Bells" at the Davenport Theater. It was the second time I saw it. This morning Fieda, Abe and I went for a walk in Crotona P. We went as far as Third Avenue and Fremont Avenue where Borough hill is. At 6PM Hy and I went skating to Harry Schwartz's house. It was a cold day. I went to the Y early and swam, exercised in the gym and participated in club activities. The weather was cold again. We heard speeches in Speech class. I will say my speech on Thursday or Friday. I will be 16 years old. It's raining a lot today. In school I received dictation of 100 words-a-minute. We practiced it first a few times. I saw Berny in the morning. H. Schwarz, B. Yesurolay, Hy Bermy and I went to find out about the club's lumberjackets in a store on Boston Road. I studied speech today. At night there was a big election fire in the street. La Guardia was elected mayor. McKee came out second and O'Brian was third. At 10:30PM, on the radio, we heard La Guardia speak. This was a typical school day. I gave my speech in school. I felt that it was done OK. The title of the speech was "Chenny Ives Gateway." I hardly realized it was my birthday because I am very busy. I spoke in the Young Orator's Club on the "advantages of open school work" The school held services for Armistice day. In stenography we did 120 words per minute with practice. At night Abie and I visited Sophie. She will soon go to the country. Later Abie and I went to the scouts. I went with Berny to see Monroe play Wash. Monroe won, seven to zero. I met Schwartz there at night, then went to the library. I took out "La Bagola". It is very interesting as far as I have read. In the morning I read La Bagola. It is about an African savage who came to the civilized world. There he was a stranger but in his own country he was an alien. Later I went to the Y, Swim and Gym and had a club meeting. I went to the main building to see my annex play the main building. They won 24-20. What a game!!! Sophie came home today and told us all about the hospital. I was notified that the Arista had accepted me. I played soccer at school. I went to the main building and finished La Bagola. Abie passed his second class test. We might be joining a troop on Jennings Street. I went on my skates to buy new wheels, then went out with Abie on an errand for a man on 165th Street. Then I left Abie on 125th Street and went to 116th street where I bought 4 skate wheels for 50 cents. Mrs. Geashow and Gurg visited us later that evening. I went to the Y and played basketball, etc. I went to my first Arista meeting. Scott was elected secretary. Sophie went to the country. I saw my annex beat Clinton annex in basketball at the main building. The score was 26 to 8. It was an excellent game! After school I taught stenography to David Goosey at his home. Wade came over. It was the first time I saw him. Ma is sick. I visited troop 112 on Jennings Street and Pospect avenue. I was thinking of changing to that troop but I belong to the Y and have no time for it. I received a postcard from Sophie in Loeb memorial east view, Westchester country. I saw Donna's son Ralph. Eddie and I went to see Dona. Ralph was born a few weeks ago on October 20. They live on 173st near Boston Road. H. Schwarz and B. Yeserby brought me my lumberjacter. It is blue and grey. I was very much surprised. Everyone likes it. We had a lot of visitors here. Pa joined the library. I Went to Y, Gym, Swim. Club jackets were given out at the meeting. Later Mr. Samuels played the piano while the club sang songs. Phil tried to talk to Pa. He put the marriage ring on the table where Pa was standing, but Pa walked away. No success. I wore my new club jacket to school. Everyone liked it. Ma is still sick. She had to see the doctor yesterday. Her fever was 104 yesterday and today. I'm happy because Ma is getting a little better. We went to the auditorium. It was an Arista Assembly. The new members were inducted into the Arista. Scott and I were the only boys. Abie and I skated to 136 Street. Ma got better and left her bed. Hy and I walked around the park and neighborhood. Joe and Morris came here on Bicycles. I was going to go with Hy to 136th street on the bicycles, but Joe's bike got a flat. So later I skated there. The gang went on Willis Avenue to see the parade. Some men were throwing pennies. I was able to grab 2 of them. Later, Hy and I walked home. I went with Abie and Frieda to Bronx Park. It was cold. We skated from 2PM until 4PM. At night Hy and I went to the Davenport theatre and saw "Bells". It was the third time I had seen it and the fourth time for Hy. Later we found the gang walking on Broadway and Larry took pictures. I saw Berny today, but I stayed home and hardly did anything. I went to the Y. I learned to swim better. Madow was impeached as Nice-Pres. I said my term speech in school. It rained some today. Ma is better and has all but forgotten she is sick. It is a little bit cold. Repeal. The 18th Amendment was Repealed. My sheepskin coat and Burnie's sister Laura are 3 years old. The weather is rainy. I went to the History review class. Today I took a Spanish Dictation midterm examination. I think I got about 75 % on that. I saw my annex play Washington Avenue annex in Basketball. Because of yesterday's rally during the lunch period, nearly all of my annex saw the game. Some teachers were there too. We won 26 to 12. At night I went to Larry's house with Hy. But I didn't go to the scout's. Today was very cold. Eddie B. was here all day. A lot of relatives were here before they went to the wedding. Jackie and I went to the library to renew La Bagola for Edith, but they would not let me renew a second time. Then we went to the wedding which was held on Crotona Avenue. We danced, ate cake and drank wine. I was introduced to Hermann J Maurer and his wife. We took pictures. Then the ceremony began. Sophie was in the country. After everything was over our family rode home in a taxi but Joe, Hy and I walked. Pa didn't go to the wedding. Sunday, December 10, 1933 Regina's Wedding, Frieda's Birthday. When we got home form the wedding we developed pictures. Molly and Joe slept over at our house. Hy and Joe slept in Phil's room. In the morning everyone sat around the table and ate breakfast. Frieda is 9 years old today. I went to the Y and Gym, but did not go swimming because I had caught a cold. I went to club at 4PM. At night we went to Regina's and Jack's wedding. Sophie also missed this wedding. They had a band and old and young people came. During the ceremony, Hy took a picture while the Rabii was singing. After everything was over we rode home in a taxi. We got home really late, around 1:30 am. It snowed for the first time this autumn today. I had part of my speech midterm, but it didn't go well. I took more of my speech test and did a little bit better. I went to Bella's house with ma. Ran to school for a spanish test. It was a midterm and didn't go to well. Later I went with Abie to 136nd Street. It snowed some more. I saw Barbano, then road home on the car. I had a stenography test that I found very easy. Then I walked home through union avenue. Phil and Della came over. It snowed again today. I had bookkeeping and history tests. Both were easy but I didn't have enough time. I stayed home all day. The family went to see Phil and Bella. Hy enlarged their wedding picture in school. Our apartment was fixed by an electrician and a plumber. I stayed home. At night, Phil came over with his wife. Wm. Klosty was here also. I went with Abie to the library and took out "The Boy's Life of J. Roosevelt," by Hagedonon. Abie took out "a Son of the Middle Border" by Garland. Hy and I printed pictures of Phil and Regina's wedding. At noon I went to the Y. Then I went to the Junior League Rally in Buttenweiser Hall. Later we had a club meeting. At night I read part of T. Roosevelt. I never read any more of that biography. At school my midterm mark was 83%. In 1st term, 93%; in 2nd term, 92%. Sophie came home from the country. Mrs. Glashow and Mrs. Kramer visited us. After school I saw my annex beat Townsland Harris' varsity basketball team 26 to 10. At 6PM I came home very hungry. After eating a little bit, I felt a strange beating in my arm near my shoulder. I thought something was wrong and that I was sick. Phil came over. I stayed home from school expecting to go to the hospital. But I didn't go. It is raining now. This afternoon I fell asleep until 6PM. We have lived here exactly 2 months. Fellow students in school brought food for the poor. Tonight I went with Pat Max to their club meeting to see how they go about it. Here is what happened. We got there t 7:45 and only the Secretary, Treasurer and Diamond (reader of the minutes) were there. More members came and I was introduced to some. Max told me who was President and who other people were. Nathan soon came in. It is now about 8:20PM and there are about 30 member present. Pa told me to take some notes of the meeting in stenography. Getzel finally arrived. At 8:45 I heard the president say to his father that he will soon open the meeting. The president informed everyone that a member fell out of a window and died. So they put out the lights and there was a player in the dark. I didn't have any hat to wear. The minutes of December 7th were read. He read of candidates for election. He read of Phil's wedding. Nat was club representative. Pa's wage is $6.25 Wedding gift $10. The organization is worth $10,277. Hospitaler gave report of sick and benefit. Progress of the various committees were reported. Banquet was reported $159 was collected for it. Pa was put on a committee to report on a prospective member. Contributions to the Jewish Blind 602 Jennings Street. Tellers were appointed. Sydney Schindler elected president. 1st 9 second group declined for vice-pres. H. Landisman was elected unanamously. Hardly anyone wants to run. Dr. Weingarten was elected unanimously as doctor. 3 men are running for uptown office. They gave out papers with names of candidates. And the voters handed in 2 of those they want for the office. 59 members were present. Notes also: Lownbrown 51, Lowbman 48 Rubenotun 15 .The two highest voted for were elected. David Cren was elected Frinax Seen unanimously. Recording secretary Hirsh 25, Diamant 35. Diamant was the winner. What about the president. Father left his seat, the president ordered him to sit down again in the teller's chair. Everyone laughed because his son ordered him. 9:50PM, 58 members present. Treass. M. Schotzberg elected unanimously. Trustees: Dr. Schneer and J. Zuckerberg were elected. In school they gave food to the poor. We had entertainment in room 304. We saw a play and sang songs. Jack Lystman and his friend played harmonica and banjo. At night Abie Jackbowitz came over. I saw Berny today. At night we walked Ma and Sophie to Phil's house. Went to the Y. Swimming is much easier for me now. A school friend, Hyman Lubousky, came to the Y. We had another club meeting at 4 o'clock. At night Hy came to the Y and we saw "Farewell to Arms", a sill symphony and sport news. At night Sophie had a party at our house. Later Hy, Phil and I entertained everyone by playing on our harmonicas. When 12 o'clock arrived we played "Jingle Bells" and "Twas the night before Christmas". We went to sleep at 2am. I woke up at 11:40am. Hy and I walked to 136th Street. It was a sunny day. We expect to go on a hike tomorrow with the L. New Years we are having a party. Later we walked home with Lary. It was snowing very much. So there was no hike to the Palisades. Hy and I tried to get a lift downtown to Willby's Photo Stove on 33rd Street to change flash bulbs. But it was snowing too heavily and we could not get a lift. In the afternoon, I took a walk in the Park and street. At night Hy and I went to Mandelbaum's house but he wasn't home. The snow was 8 inches deep. I stayed home until 1:30PM. Hy and I went to Mandelbaum's house and then to Bronx Park. We walked around for an hour and then went home. The temperature was 18 degrees. At night Hy got photo equipment at 174th street. I stayed home in the morning and wrote some things for Carlyle club in the minutes book. In the afternoon Hy made a printing box and then I taught him dancing. At 4pm I took a walk to the library. The ground still has snow. The temperature is 28 degrees. This morning we went to the Coca-Cola plant where we waited for the Y junions. It was very cold. The temperature was below 0. The Junions came at 11am. We saw the Coca Cola plant. Then we ate biscuits and all the Coca Cola we wanted and sang songs. When the party was over, Harry Schwartz, Ben Yesersky, and I went to 136th Street. First we stopped at Sylvea's house. On 136th Street we saw Mom's Madow. We may not have the party New Year's Eve. Hy and I saw the Borkan's and also Esther, Mr. Singer, Scott. Scott's mother gave me a coat. Hy and I walked home in the freezing weather. We got home at 6 pm. After supper we printed pictures and so we were up until 1:30am. The weather was the same as yesterday's -- cold. In the afternoon Abie, Pa and I all went to the library. Ben Jesensky lost his $5 bill, pocket book and Y card, etc. Our club lost to the Marshallain Basketball club. I swam for only 1/2 hour because there was an organ recital at 3pm. During our 4pm club meeting I acted as president because the president and vice president were absent. Later we debated on War and Peace. I arrived home at 7pm. Al was going away with Edit. Hy and I got the house ready for the New Year's Party. The gang came at 9pm. Present were Rose, Sylvia, Morris, Joe, Larry, Milty, Frieda, Abie, Hy and myself. We danced, ate and had entertainment. 1934 arrived with a bang and we made noise. We played the radio all of the time. The party last until 2am. I woke up at 12 noon. Hy and I went to 136th street at night. We stayed by the butcher stone. I had a typical day at school. Another typical day at school. Everyday I play association during the lunch period. It rained a lot today. We had a party at home with the family at night. I woke up at 10:30. The weather is getting warmer. It's 40 degrees out. I stayed home in the morning and did homework in the afternoon. At night Hy and I walked to 136th Street and saw the gang. We left at 11pm and rode home in the subway because it was raining. We got home at 11:15pm. I went to the Y and to an organ recital, then attended a club meeting. We had end terms in school. Then we had an Arista meeting. We expect to have a party with the Service League. That night Hy and I walked to Phil's house, then walked home with Mr. Annexstone, Phil, Snokie and Ma. I could not get into Monroe's Senior prom, but Hy was able to. I met Berny and had fun at his house. Today is a very nice day. I went to the Y and swam in races. During the club meeting Scott was voted temporarily into the club. We will soon have a party. Eddie Cantor is very funny tonight. The school term is about to end. Regents week is next week. No regents for me. But next term I will have 4. Home news had a picture of Regina and Jack. I sent post cards to absent club members. I am failing speech, but our annex basketball team is undefeated so far. The championship game was played in the main building against the Brown Place Annex. There was a lot of fouling and crooked work during the game. Then there was a fight. We lost 11 to 8. I didn't really learn much in school or do much homework today. Edith gave Ma a dress for her birthday. She is 52 years old tomorrow. Students are bringing the "Lower" (school magazine) to get signatures. My mother is 52 years old. I brought my album to school. Only Mr. Bunis gave us a lesson today. I went to Davenport Theater and saw "A Tale of Two Cities." Davenport acted as Sydney Carton. The gang was: Myself, Hy, Joe, Morris, Rose, Syl and Della. In the morning Hy studied for his regents exam in the library. I went to Mandelbaum. He wasn't home. Hy and I saw him later and he gave us some radio stuff. Hy and I are interested in building a crystal or a 1 tube set. I got Joe into the Y. Gym. Swim-races. Our club beat another team. At 3pm I listened to the organ recital, then went to the library. Later at 4 our club met. Scott was voted in. At 6:30 I got home. Al was here. Later Eddie Canton was very funny. At 11am I walked to Scott's house. Then at 12:30 I saw Abie in his classroom. I visited Scott and we spoke about radios. He gave me a 3 tube radio which I could use to build the radio. He also gave me 9 big batteries and 2 single ones. At 3pm I met Abie again and we went to 136. I saw Joe and Abie J, Bortans and Esther. We took all our things at Scott's house and rode home on the car. Today it rained a lot. Hy took the English Regents exam. He brought home some radio things he found. Joe came over and we walked in Crotons Ave and Lemont Avenue. Joe, Hy and I went to the Bronx Park to take pictures of the falls, river, bridge and Rocking Stone. We developed the pictures at about 6 o'clock. At 8pm I skated to Scott's house. He gave me some searchlight batteries and another radio. Hy and I printed pictures until 2pm. We went to 136th Street at night. Sylvia Benes is graduate junior high school and so is Abie. Hy and Aaron Bendich are graduating high school. I woke up tired. Abie went to register at Monroe. Freddy Scott came over at 11am. We made a tuning coil. At 3pm Pa fixed my pants pockets. I'm writing this at 5:25pm. I walked to 136th Street. Sylvia came last Wednesday. The gang played cards in Mark's house. I walked home with Sylvia. Bella and Phil visited us. Y, etc. I had school all day. Abie is going to graduate tonight. Scott came over after school. Today is promotion day. Hy graduated at night. La Gualdin was at his graduation. The Arista and Service League had a party in school. A new school term begins now. It snowed today. Weiner and I helped move books from the main building to the annex. We rode in Mr. Shillings car. I went to halts house and to 136th Street after school. Scott sold me a tube. I made part of the Kacked. Y. Did not go to swim, or gym. I must have stayed home to eat dinner. After the club meeting, we had a party in the scout room. Then I went to Sylvia's house. Weiser nominated me for a class office in school and I was elected. Eddie came over this morning. We went to 136th street. We were up Weisel's house. Y. Etc. At night, Joe, Hy and I went to the coliseum by Starlight Park. We sat on the platform and shook hands with Robert Minor who was running for mayor. We went to 136th street at night. I decided to start a camera club at school. I began to get members for the camera club. During the night the whole gang was at 136th street. This was a reunion of the gang. I went to see Joe rehearse "Strike Me Red", but they didn't rehearse. I went at night with Sophie and Edith to see the "Voice of Experience." Today it snowed very deeply. My spanish teacher, my history teacher and a large number of students were all absent from school. Mr. Familon was in care of my spanish class. There were only 7 students present and we had a lot of fun. I was involved in boxing bouts after school. We took pictures and developed them. It snowed today. I ran 110 yards in 14 4/5 seconds. Jack and Regina stayed here all night. We told fortunes. Todays weather was much nice. The weather today was even nicer and warmer. I went to the Y to practice for harmonica entertainment. Mr. Elkan made a speech to the boys of the school on their behavior. The Purum Bazar was in Buttenweiser Hall. Hy and I played our harmonicas and Joe sang "Jimmy Had a Nickel." Rosensky played his violin. Rose and Sylvia were there. It was 70 degrees out. I made a speech. There were elections in school. Rothstein beat Linden. Abie's 14 years old today. I spoke on photography at the Young Orators Club. I heard the orphan asylum program at home and visited Sylvia's at night. During the club's meeting I acted as president because the president and vice president were absent. Karpen was elected president later because a letter from J, Aron said he resigned from the club. I later gave a talk to the club on photography. Edith is 21 years old. School elections were held today. During the study period Scott and I talked things over. Abie, Hy, Joe and I went to the Museums. First we visited the Musuem of Art, the American Wing, etc. I took a picture of Joe, then of Abie, Hy and I by the Obelisk in Central Park. We walked through the park to the Museum of Natural History. In the park we took a crazy picture by the lake of Joe, Abie and I. In the museum we saw the plane that took the Lindenbergs around the world. We also saw their supplies. Later, Wex met Karpen, Lichy and Rosvsky. I stayed with them while Abie, Hy and Joe went home. They took a picture of the parade. We walked through the museum in the park by the mall. Then to 42nd Street where we went home by subway. The club tried to impeach Harry Schwartz as Vice President. But we failed because he was really President since Aron resigned. We took a picture before the club meeting. Ive joined the club. I made a speech at school. It was by Mark Twain. Today is the second day of spring. I was one of 3 who got 100% in the BIS test. Today is cloudy and snowy. I saw Henry. Hy went to the May Fair Theatre. I read "Edison". Bendub's Birthday. Went to 136. Sylvia's house. Didn't go to the Y. No meeting. I played very well in baseball, then went skating at night. It rained today. This morning Mrs. Schoof told us about the New York Times job. I read "Life of Edison". I attended the Young Orators Club meeting. I spoke on Edison's life. Then I went to the Times building where I got the job selling the Times in school. I read some more of Edison's Life. Because today is Good Friday there is no school. Joe came over and we played ball, then I went to 136 st. I went to 136 st. At Joe's house we took a picture. The gang got together. I went down to 136 St. Scott, Borkans, Weisers, etc. were there. I was home today. We developed pictures. I went to 136 st. I got an order for the Times in school for the first time. I sent in the order Tuesday, April 10 and got the paper by a newspaper stand on 156st and 4rd avenue on Wednesday April 11. I am building my route in school by speaking to classes and having teachers do it for me. Mrs. Schoof, official and history teacher got me 22 customers. I went to pay for papers at the times. I received my pay by check in this morning's mail. Abie and I were walking in the park and we saw a group of men who must have been discussing politics or business. So I said to Abie -- "crap game." The men seemed to be in the position of playing that game. Hy and I went this morning to see Wade where he fixes stoves on his boat. Tonight Eddie Cantor entertained on the radio for the last time this year. 4 children were killed by their father while the mother was out of the house. It happened on 137 Brook Avenue. There were several fires that burned some old tenement buildings in Manhatten on 99 street. I found out that Max Gross had died. He had heart trouble for many years and he once told me that a doctor said he would not live more than 25 to 30 years. He was about 16 years old then. I have known him since 1926 or 1927. He used to go to the country because of his ill health. It rained today. I sold the Times in school. I called up the Times. Wade called at night . I showed him our radio set and photography pictures. I took stenotype in school. That is, we take dictation and type the notes. We didn't have a 3rd period (English), but instead we had the 5th period because we were going to have a school spirit assembly at the main building. After school I went to the Times building to pay the bill. I bought Hy some things at Willoburys Photography Store. We listened to the Communist speech here at night. I was home in the morning. I did my homework and fixed things. Hy and I went down 136th Street. We found out that Paul's mother had died. Y. Played handball on the roof. I watched my annex play Monrow. We won. Early in the morning at about 7am, Hy and I started to go on a hike to Jennafly. At the Dykman St. Ferry we waited until Rosevsky, Karpen and Litchy came. We played basketball on the road in Lampfly in the afternoon. When we ate we had plenty of food. Litchy forgot the can opener and we had to open a can with a fork. We built a fire. At the end of the day we crossed the Washington Bridge. We had a swell time!!! Weiser and Trystman and their band played with harmonicas on WBNX. Hy developed and printed pictures. Woadin died at the age of 65 years. I found out that the curtain in the Davenport theatre burned. After I went to the Times Building, I met Sophie at Reliables. Today was nice. I went to 136th Street. On the way Scott told me about a job in a glazier's store. I saw Weiser's band. Hy and I went to Wade's. The temperature was up to 86 degrees. I sold 25 Times newspapers. I got the job Scott was telling me about. It is a glass store and a window shade store. Mr. Mihensky's store i on Bergen avenue and 147th Street. I went to Junior League. I am 16 years and 6 months old today. At the assembly in the main building we had a Service League assembly. We feared the First Lady of Morris. Scott was 6th best Annexite. The Stenography class went back to Room 204 and we do not type our notes anymore. I was excused from school to go to pay the bill at the Times Building. I went to work as usual at the glass store. Hy came to the store and told me that Morris sent him a post card stating that he should see him immediately. When Hy came back, he told me that Joe ran away from home. I found out that Joe was in St. Louis. I earned $2 pay. I now have $7 saved up. Tennafly again. There was Hy, Morris, myself, Rose, Sylvia S and Sylvia B. We camped at the same spot that Hy and I had camped at two weeks ago. We built a fire. On a tree near by it said that a fire cannot be made without permission. We had a good time. We had a Spanish mid term examination. Today I had a stenography and history test. Henry Manus took me home on his bike. I wrote my diary at the store. I had a bookkeeping test. Today I stopped work at Mr. Michonsky's glass store. I got $2 and went to 136. Hy and I went to Wade's. Was over at his house and we left him by 174th Street Bridge in his car. We placed the bed next to the window. It was a warm day. We went to the polo grounds with the annex. The Giants beat the Cubs. Hy was sick today so I worked at Regina's store. It rained. I skated to 136 and visited Weiser's house. I went to the Y. Levine and I walked to Central Park and saw a baseball game. We had a club meeting. I took pictures in school. Divinity at Night. On the train riding home there were two men and two women who said Hy and I look alike. Hy and I saw the two women on the train three months later while we were riding to work. The day began cloudy. On the trolley, there were many students including Shilling's brother. On 125th Street there were many Morrisittes walking to the Dock. I wore my lumberjacket and carried a satchel with a sweater, lunch and a camera. We saw the fleet as we rode on the Peter Stryvential up the Hudson River. They had dancing on the second deck. Edith Schaffer, Diana, Della and Sylvia were on the boat ride. We passed under the Washington bridge and I remembered the time when I crossed the bridge when we (Karyn, Rosevsky, Litchy, Hy) came home from the hike to Tennafly. I lost the black ball when I was with Della's friends. At the baseball field the teachers played the Proun Place Annex baseball team. The score was 6 to 6. Mr Weinsaub smacked homers. After the game, the boat left for New York. On the boat I snapped pictures for the students. I took pictures of myself and one of the fleet that was anchored at about 129th Street. When we landed, it was the end of a happy day. In Crotona Park, a picture of Betty and Frieda next to the cake was taken. Also a picture of Pa, Hy, Frieda and I.
I collected money for pictures of the boat ride. Morris had a contest between the annexes and main building in relay racing. I was third runner. We took 1st place by a large distance. There were: I Skar, Rimen, Manus and I. We will get emblems. Mr. Epstein was surprised at how good I was. I took more pictures. At night Wade showed us his radio equipment and we showed him ours at home. Today was the Service League Hike. Mr. Bunis and the Service League and myself went on a hike to Tibbett's Brook Park. Mr. Bunis' brother and friend were there too. Also San Filipo, Piggy Parter, Goodwin, Rooth Linden, Fat Richman. I had one picture taken of the group. It was cloudy at Tibbett's. We played baseball and had fun. I was apposite Mr. Bunis' side but on his brother's side. We won. Later it began to rain and we stayed sheltered under a shed by the pool. We hiked home singing and cracking jokes. Especially Mr. Bunis. We bought ice cream at the station. Mr. Bunix got off on Mr. Eden Avenue. He lives on me lombes Dam Road, I believe. We went to Yankee Stadium with the Annex. At the athletic assembly I received a medal for first place in high jump and an emblem for the relay race. Joe and Aaron were 17 years old. I took my first Regent's exam, etc. History in the main building in the morning and Spanish in the afternoon. It rained. I took my Stenography Regents. Hy and I visited Karisen and Litchey. Hy and I walked to Starlight Park. I want to join up with a pool. We found out that it cost $5 each at starlight. Hy doesn't want to join. Joe, Hy and I went to the Metro for 25 cents each. We went swimming and did tricks on the canvas. We then ate. We visited Wade and asked him about going out on Sunday. Jack Barkan came to Longfellow Avenue. We went on a Canoe ride with Wade and Hy to Ferris point. We went to Wade expecting to go out in his motor boat. But it didn't start. We ate on his father's boat. The canoe was picked up by one of the boat owners. We dressed ourselves in our bathing suits. Each one had an oar and we rode along nicely. We passed Castlehill Pool. At ferris point we stopped after we had almost tipped the canoe over. The results of my regent's exams came back. My scores were as follows: Stenography: 87, Spanish: 82, Bookkeeping: 73, History: 44. I went to 136th Street and saw Milty about a chromat but didn't buy anything from him. I stayed absent from school because there was nothing happening. Scott moved to 476 Willis Avenue. I received my report card. I went to the main building. My teacher is Mr. Glasser. I walked home with Abie and Jackie. Peggy and Co were there. Hy, Abie and I went to Tibbett's Brook Park. We hiked for about an hour. Then we did tricks on the athletic field. We wore our shorts. Later we sat by the pool and watched the people diving. I was encouraged to buy a pool ticket to the metro. I went over to Umensky's house. We walked over to the Metro pool and looked into the place on the side where the railroad passes. It was a hot day. At night Hy and I joined up for $7.50 each. I am very glad of that. We played some handball for a while today. We went to the metro today for the first time on the pass. We got there at 11:30am and stayed there until 8:30pm. Hy and I walked on Jackson Avenue to St. Mary's Park. Joe came there also. They had the regular "Fourth of July" meets. Joe took first in the high jump and received a pen searchlight. I got one for eating a cracker and whistling. I pushed the cracker down my throat with my fingers and whistled with them. At 7:30pm Hy and I went to the Metro. "Crazy" Davey was there and we saw Sophie's friend. We also saw Nettie but didn't speak to her. We stayed there when it got dark and the lights were on. Hardly anyone was there. We left at 10pm. I went to the Metro from 12 noon until 5:30pm. We have colds so we didn't go swimming. In the morning we went to the park and then to the library. In the metro between 2 and 6 pm we hardly did anything because we have colds. But we stayed on the canvas. I was at the Metro from 2:30 to 6pm. I did nothing. At night a fellow from the next building helped make a short wave radio. It rained today and was cloudy. Later we saw the Tibete's and spoke to them about going on overnight hikes. We went back to 136th Street. Spent the afternoon at the Metro. Sylvia Beres was there with Marion, Jeanette, and Rose Cantor whom she introduced us to. Marion and Jeanette lived on Wilkins Avenue. Rose's father owns the candy story between 136th and 137th street and Brook avenue. I went in the water. Spent another afternoon at the Metro. Hy still has a cold. We stayed in the sun. I lost my pass to the pool. I went to the metro from 10:30 until 11 am. We were robbed of our bathing suits and Marion's ball. We were shocked and regretful. We looked all around the place for anyone with our bathing suits. Jack Fogel was there as were Sylvia and Rose. July 12, 13 and 14. It was cold and cloudy. When we got home we were afraid to say anything. We fixed up Phil's bathing suit. At night on the way to 136th Street last Friday we met a boy giving out circulars on Boston Road. His brother worked at Stanleys. We asked him if we could get a job and he said we could. Today we went to get the job at 5pm. We were told to come back later. We stayed in 136th Street. Later Arthur, the man in charge, gave us the job. I worked with one boy in Washington Heights and Hy worked with Bratus in Harlem. We met on 149th Street Bridge. Today is Phil's birthday. He turns 26 today. I went to Washington Heights again tonight. I worked alone on Walton Avenue route. I got paid $1.50. I went to the pool, then to the metro from 12 until 7:30pm. We went swimming in Phil's bathing suit. I got a duplicate pass. I had to run home in the rain. I was at the Metro from 11:45 until 2 pm. Then I went straight to work. Harlem. Metro 7:30-9pm alone. Hy and I bought bathing suits from a store on 148th Street and Bergen Avenue for $2.75. I worked in he afternoon at Washington heights with Charlie Luria. It was hard for him. I went to the Metro from 12 to 4:44 pm. Jack Borkan was there. We went fetching for things in the water. Jack Katy was at the Metro with us from 12 until 6:30pm. We played handball. Jack Borkan is 15 years old. Abie and Jackie went to the Metro with us at 11:30am. I went to the pool. I saw "Taryan and His Mate" at the Boston Road Theater. Jackie went to the Metro with us. Jack Turer, uncle, began eating at our house because aunt Esther and family went to the country. It rained at night so we didn't work. We went to 136th Street. Marion, Jenette, Rose, Harry, Morris, Sylvia, Rose, Hy and I were there. Jack Katz was at the Metro with us from 12 until 7 pm. We played handball, swam and so on. Hy is 19 years old today. I went to the metro from 11:30 until 5. I saw "Baby Take a Bow" with Shirly Temple at the Boston Road Theater. Jack Katy was at pool with us from 12 to 6pm. We expected the gang. Abie was at Metro. Hy started school at Baron De Hirsh Trade School to learn to be a machinist. Hy, Abie and I went to Bronx Park. We took pictures. We went to Sylvia's house tonight. Hy and I went to the Metropolitan pool for the last time this year. At 2:10 pm (it rained in the morning). We took 3 pictures of the pool. We left at 5pm. We developed the pictures at night and Molly came over. We played cards. It rained. I wrote in my diary. I wrote in my diary, then played cards with Abie. Hy printed pictures. At night we went to see a play in the park. But there was none. All summer there were plays in the park. I saw "Uncle Tom's Cabin." I bought skates for $1.25. It rained terribly today. The Morro castle, a passenger ship, burned near Ashbury Park, New Jersey. Hy worked for the Haferlings. We printed 60 pictures. Then took pictures for Irv. Borkan on Sunday and made them today. School. Visited the annex also. Saw treasure island at Loew's Fairmount. Carlyle club meeting for the first time this season. The Lindy Kidnapper was found! Hauplmann. I rejoined the Y. Hy also did. Saw "Julius Ceaser" in the Park. Got health examination in school. Went to Mr. Comles Dam Park Almo. Morrie, Hy and I visited Joe in the hospital. Hy and I saw Karpen and Litchy later. It rained today and Pa is sick. The doctor was here. Hy and I got exam in the Y.
Pa was paying $32 instead of $35 for rent for several months. We got a a disyiosses on September 27. Ma went to court on October 2 with Phil. They saw the place of the cemetery where the Lindy ransom was paid. We must move by October 9. I wonder if we will. Sophie doesn't want to move. Jewish Holiday today and yesterday (no school). Went to take back the old job of giving out circulars. But Arthur (our boss) said he'll write me a postcard when he needs me. Edith gave me a pass to the Boston Road Theater. I saw "Upper World" with Ginger Rogers and Warren Williams. Then I saw "Shoot the Works" with Jack Jackie and Ben Bernie. Sophie, Ma and I went looking for rooms on Jennings Street, etc. The world series games were this week. The weather is very nice today. There was a party at the Y with the club. It was a big expense and we didn't enjoy it. We went to the Annex in the afternoon. Yesterday I read part of Abie's book named "Criminology." It's interesting. I skated to the Borkans and Abie took the bus. I arrived ten minutes before he did. Pa bought me a pair of shoes on 138th Street and he later went with Abie to get him glasses. Abie got a sweater tonight in the market. Rose, Sylvia and Joe walked here at night. I visited Sylvia at night after the Y.
I went home after 4th period at 11am. We have lived here 1 year. I am reading the "Conneticut Yankee" for school. Ralph, Dora's son and my cousin, is one year old today. I played basketball in a schoolyard near Koryia's house. I bought sneakers at night. The Students Forum Club in school had speakers talk on their own party's policies. There was a Socialist, a democrat, and a communist. The communist was a colored lady who is running for lieutenant governor. The students later attacked the representative with political questions. Regina had a baby boy. I found out about this at 12:40pm when I got home from school. It rained in the morning and the sun came out in the afternoon. It was a cold day. I worked at Regina's store on Westchester Avenue. The customers were surprised about Regina and they congratulated Mr. Haferling. I worked until from 1:30pm until 6pm and earned 50 cents. On thursday, November 8, they had the Bris. I worked after school from 12 noon until 4:30pm and got 50 cents. A lady was in the store to help me. The temperature is around 60 degrees. The grocery union boycotted our grocer, Mr. Stolnick. Men made speeches from an automobile and they razed Mr. Stolnick. I found this out when I went to buy a box of crackers. Hy and I walked to 136th Street. There was a fire on the gutter near 520 on 136th Street. Lehman was reelected governor. Mostly democrats were elected governor in the country. I walked with Sophie through Crotone Park and to Clairmont Park. I am 17 years old. I worked for the Haferlings. Sophie, Hy and I saw "Strike Me Red." Joe is in the play. Sophie treated me to the Paradise Theater. We saw Eddy Cantor and Rubinoff and "British Agent" with Leslie Howard. I worked at Abie Haferling's store. I went to the practice dance in school. I went with Hy and Abie to the Cresent theater (now the Tower) and saw Harold Loyd in "The Cat's Paw" and "Blondie." It is getting cooler. The high temperature was 45 degrees. Today Eddy Cantor was on the air for the last time this year. He will go to Europe. I studied economics with George Umansky a friend in school, who lives on Jennings Street. I worked for the Haferlings all day earning $1. Yesterday I got 35 cents. They gave up the store on Westchester Avenue. I helped Jack bring some things to the store on Seabary Place. Phil and Bellarare married already 1 year. Regina and Jack married already 1 year also. Hy and I saw "The Drunkard" at the Paul Gilmore theater on Cherry Lane, downtown. Frieda is 10 years old already. For the past week or so I have been studying Economics with Umansky and History with Maurice Topping. Today I had my English mid-term. Economics and Law mid terms. The temperature was 32 degrees. I found out that I got 79 on my History test. I scored 78 on the Economics exam and 91 for the Law test. In Economics, Weirer got 65, Neyer 65, Kushner 65, Levy 81, Scott 92 (highest), Umansky 79. In History Topping got 71, Zudeck 72, Neyer 83, Sylvia 88, Kushner 72. The club and Hy class in Baron De Hirsh saw "Wednesday's Child." I went to the annex after school. They had entertainment --- a play, songs, dances, etc. Prizes were given out to teachers. Mr Bunis got a rattle. Mr. Stark received a Chinese blackboard. Abie Haferling and Bella were married. Hy worked for Abie. From Dec 25 through Jan.1, Tues through Tues.
All week I studied History and Economics. Went to 136th Street. Was home. Read the Reader's Digest, etc. Phil and Bella opened up a new home at 1820 Belmont Avenue. Abie, Frieda, Ma and I were there with Bella when two men had a hard time "squeezing" the furniture into the apartment. They got a new radio. I bought there (Bella) Bulbi. Hy came later. I like the apartment very much. The temperature is 30 degrees. Hy and I, for the first time in 3 years, did not celebrate the New Year. We stayed at home and listened to the radio. I wrote in a book some names of songs I know. Abie, Hy and I helped Phil carry some things from his old home to the new one at 5pm. It is a cold and windy day. Phil and Bella came over to our house at about 11:30 before I was going to bed. They (she) asked me to sleep at their house. I welcomed this because I like to stay in their house. They wanted me because they were afraid. I awoke at 6:45am, then ate breakfast and walked to school through Crotona Park. I will sleep at their house until they get a boarder. Hy slept with me at Bella's. Hy demonstrated developing pictures, during the meeting at the Y. It was foggy when I walked to school. Assembly -- revival of baseball in Morris H.S. 7th term dance. At night I played basketball with the club at a school on 177th Street St. Nicholas Avenue. Then I rode straight to Rella's house. She has a boarder, so I slept at home. The weather is cold, but fair. Max and family were here at night and we took a picture. While I went to the market for Ma, I suddenly got dizzy and found myself stretching my hand out toward the ground and falling. I leaned against a car and in back of me I saw a man, by a fire, laughing. Mr. Galsser is having trouble with my program. I may take the course History of Art with Zadeck. Ma is 53 years old. I slept at Phil's house. I didn't go to the Y, but studied for Regent's. Hy slept at Phil's house. History in the morning. Economics in the afternoon. I slept at Phil's house. It snowed 4 inches. I fixed my scrap newspapers. I threw out "News Week", "Time" and "Sat. Evening Post". It snowed again. Abie had a geometry test. It is only 12 degrees out. It snowed again. I went with Sophie to the Bronx park. It is 3 degrees out. I found out I got a 77 in Economics Regent's and an 87 in the History Regent's. Sylvia got an 86 in History, Neyer 92 in Hist, Neyeyr 75 in Eco, Weiser 75 in Eco, Zudeck 77 in Hist. Was at Morris High Saturday night. Hy was filling out his next terms program. Tonight was graduation night. New term. Snowed today. My teacher is Miss Finn. Lincoln's birthday today. Hy and I went to 136th Street. We went up to Jack Bordan's house. Scott wrote me a postcard about a job at 402 East 147th Street. I worked there last May. Mr. Nichunsky is a glazer. I get $2 for work. Today I got just 50 cents. I answer telephones, sweep, arrange the table, fill out bills and he does bookkeeping, books, etc. After work I saw Jack Borker, then went to 136th Street. Max came to our house and told us I became an uncle. Ma + Pa = Grandparents. Edith, Molly and i went to Phil's house. We saw Dorothy and Percy Glashow (Teddy). Willy Kloster and wife were there too. It is almost 9 years since I saw Percy last. How he has changed and can he dance!!! Abie is 15 years old today. I went to White Studios on 5th Avenue between 43rd and 44th to take graduation pictures. I had to wait about 2 hours. I went with Edward Scott. Edith is 22 years old. Joe moved to 594 St. Mary's Street. Scott moved to 3505 Rochambean Avenue. Hy got a job at Betty's Box Lunch near Wall Street. He delivers lunches. George Umansky started to work at Scott's place for Mr. Lubin on 147th Street. Senior Dance. It was OK.
Senior Dance. Danced a lot. Had a good time. Alumni meeting at annex. Weiser entertainment annex harmonica band played songs. Heard songs. All the teachers were there. Tea and crackers were served, but Weiser and I had to go to work. I saw Joe after about a month. He lost his job at a grocery. Morris lost his job at Gittleman's. Hy called me up at the store and told me to tell Joe about a job at his place. Joe got the job on Friday. I was very cloudy and cold when Hy and I left the house to meet the members of the Carlyle club at the Dykman St. Ferry. We didn't expect to see anyone. We met Geo. Yisersky on the train at Dykman Street. We met Litchy, Rosovsky and Rothstein. The ferry was not sunning, so we hike two miles to the Washington Memorial Bridge. The charge is now 5 cents instead of 10 cents to cross it. On the bridge we found the bench on which we carved our initials last April 28th. Although it was cold, we amused ourselves making fun of each other. Especially of Litchy (and myself). Arriving on the New Jersey side, we hiked four miles to Tennafly where we camped at the same spot last year. It was warm in the afternoon. But, we made a fire to fry potatoes and to bake some beans. Hy snapped two pictures of us around the fire. I snapped one from the top of a tree, and I snapped a picture of Hy while he was on the top of the tree. About 4 o'clock we started home. These are the two main features of the day. Many seniors went around with red something or other to indicate that they are seniors. It rained and was 40 degrees. There is a movement in the country to strike against war. There were demonstrations in many schools all over the country. After the fourth period students walked out of school and paraded around. Then they made speeches on 166th Street and Boston Road. I joined in after the fifth period. Hy and I bought suits for $18.75 each plus 38 cents tax. We had a light snow at night. Last night began Passover. Easter begins April 21. There was no school today, but I worked this morning. I took a picture of Dorothy. Her first picture. Joe B. and Rimen were over tonight and watched Hy develop and print pictures. Scott and I hiked to Tibbetts Brook Park. There was a fire at 1504 Charlotte Street. One fireman died. Yesterday I bought a sweater. It is a nice warm day. I worked for an auto repair store on Grand Concourse in Harlem. Morris Madow worked with me on Thursday and Friday, and Morris Bengis worked with me on Saturday. The Intermediate League of the Y held a field day at Rice Stadium, Pelham Bay Park. I placed second in the high jump. Kirshner placed second in the 220 yard dash. Our relay placed fourth. Two of Umansky's friends (one of them was called Smitty) and I went to Pelham Bay Parks for a fishing trip. It was a nice day, but cool on the water. We hired the boat at 8:30am until 5:30pm. Smitty caught several flounders and a snail. I caught a snail. The Carlyle Club created a sensation when winning the Intermediate League Swimming events against the Macabbe Association. The crowd watched while we were losing. And suddenly Kirshner, our anchor man, swam the pool gaining great distance until we finally won by a fraction. Everyone in our club was cheering and dancing because of our triumph. I worked at Bethy Box Lunch for the first time earning 87 cents. At the Y at night Edith, Sophie, Milie, Berny Schwarz, Morris M, Rose, Sylvia, Hy and I saw two plays presented by the Y. Afterwards our gang went bus riding along Fifth Avenue to Washington Square. Hy and I went for the first time to Castle Hill Bathing Park (CHBP) to register for the coming season. Our locker is E53. There is in our locker Berny Schwarz, Henry, Hy and I. Afterwards, Hy and I went to the Carlyle Club meeting at the Y. Memorial Day. May 30 Thurs, we were at CHBP. Amplifier use in auditorium in school. Mr. Glasser back after appendicitis vacation and Mr. Strom again taught us bookkeeping. Rally in school for boat ride. Went to McCumbesdam Park. Morris vs. Stywest 32-50. Morris Vs. Commora. Worked again at Bethy Box Lunch, this time earning 94 cents. I got a 68% on my English regents. Joe and Arron Bendich are 18 years old. Since Hy had to take a Chemistry regents, I work at BB. Here I first met Joe Bruno. The Carlyle Club held its farewell party of the season. Too much refreshments were brought and the expense was over $20. This is the day I have long been waiting for. Graduation! Sophie took me on a boat ride to Bear Mountain as a present. It was a nice day until showers came down while sailing home. Hy, morris, Sylvia, Rose, Edith Sussman, and I went rowing at Pelham Bay. It was a nice day. Again we went out. This time bathing at Cancey Island. I got sunburned. We once in a while went on the roof gym of Stauch's Baths. In the evening Edith and I walk around Coney Island. The rest of the gang went to Sylvia's house. Slept 13 hours; Thur 20, painted house; Mon 24, Got sweater. Hy got tennis rachet. Joe B at Pool; Sat 20, Frieda at Pool; Mon 8, Swam 25 yards in 15 seconds; Frid 19, Swam pool 4 times; Mon 29, Swam pool 10 times. I went to Louis Leplitsky's house at night. We saw Weiser, Fisher, Meyer and met mury millrod. Water Derby at CHBY. Final events for Juniors. At night I saw "She Stops to Conquer" in St. Mary's Park. Water Derby at CHBY again. This time there were final events for seniors. Very cool day. Did not work today. I took a one-day vacation and I went to CABP. 3-6 Very busy at B Box Lunch. No pool. 7. Frank Ludwig's last day at work because school term was soon beginnning. 9-13. Joe Bruns, Hy and I were the only workers at B.B.L. 11. Wed. Registered at night school. 14. Sat. Went to club andros meeting. 15. Sun. Spent the day at Casile Hill BP. It was our last day. Weather was cool but nice. Brad Channel beat CHBP in all athletics. 21. Sat. Enjoyed myself with the club. 23. Mon. Kostik began working at BB. Also a fellow called Angelo. 28. Club Andros. Rosh Hashonah. Worked. 29. Turned our bed around. With Umansky all day. 1. Tues. Had my first tooth extraction. It did not hurt. But was very uncomfortable afterwards so I missed night school and went to movies. 12. Sat. Hy bought a cat. 14-15. Went looking for a job at agencies, before work. 27. Sun. Saw at Y, "Lilium" a motion picture with French talking. 2. Sat. Civil service test. 9. Sat. Bought coat, hat and underwear. 10. Sun. Birthday, 18 years old. Went to 136th street. Hadn't been there for about 2 months. 13. Wed.	Hy Lubousky is 18 years old. Brought 69 cent satchel. Tax was 2 cents. 19. Tues.	Bert began work at B Box Lunch. 20. Wed. Completed filing my teeth at Bronx Hospital. 30. Sat. Went to Ann Badens Birthday Party (17 years old). On the way home a wild crowd in a car almost hit Jake Hirshstein, me and a girl Ann. Hy Lubousky got a job as a stenographer. 5. Thur. Kostik's foot was hurting him, so he took a vacation from work until Wednesday December 18th. 6. Fri. Morris Bengis got a job at BBL. Until Le quit with Joe Bruno on Thursday, February 20, 1936. 7. Sat. Pa's club held a ball. It was a swell place. I got a sore throat. Resulting in a cold that last for about 2 weeks. 14. Sat. Bell Weiser had a party. Hy and I were there. 16. Mon. Albert and John were new fellows at work for $3 a week plus tips. 21. Sat. Club Andros Party. 22. Sun. Intermediate League Chaskah Party. 31. Tues.	Club Andros New Year's party. I stayed late at work.